Chanel Vitalumiere Loose Powder Foundation is the newest foundation offering from the brand and claims to bring the benefits of the "Chanel Light Box" to the skin - a new generation of high-definition pigments to smoothen the skin and blur imperfections, giving the skin a radiant, natural look. 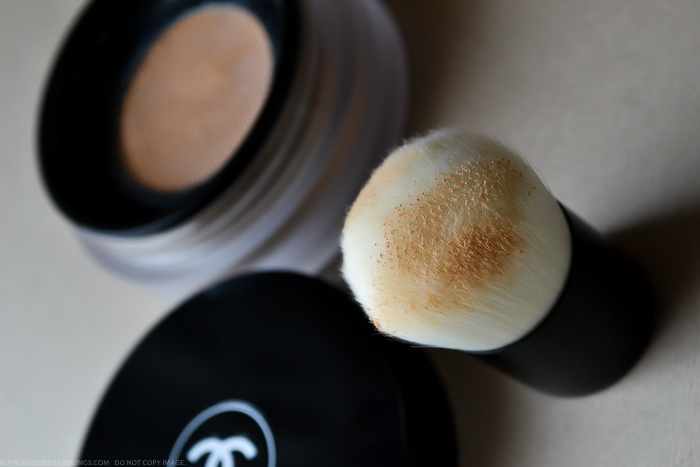 Chanel has also included an adorable mini kabuki brush with the foundation. 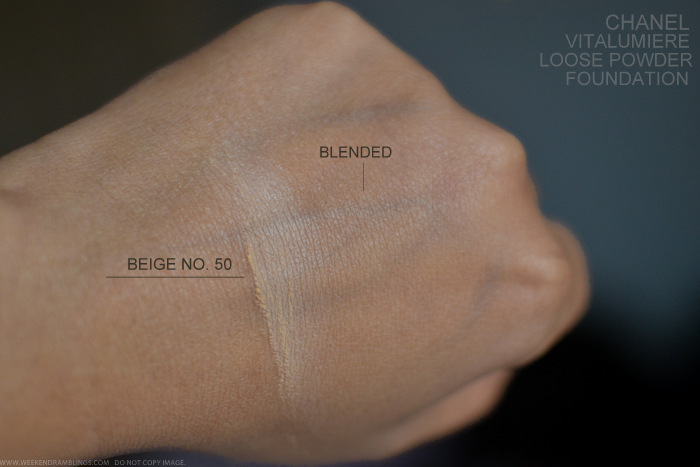 As far as I know, this foundation comes in 5 shades, and I picked the shade Beige 50. I have been using this foundation for a while now and finally got around to posting a review. 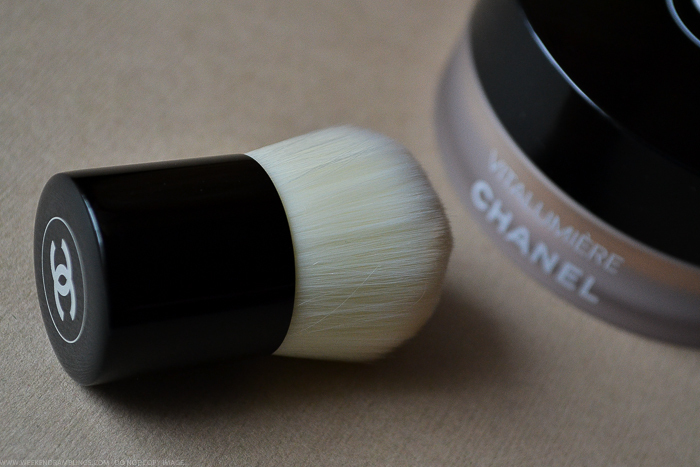 The post is a bit picture heavy, but do scroll on for a peek at the new Chanel Vitalumiere Loose Powder foundation. The foundation comes in a tub packaging with a plastic seal over the mesh - peel off to reveal the mesh/sifter underneath. 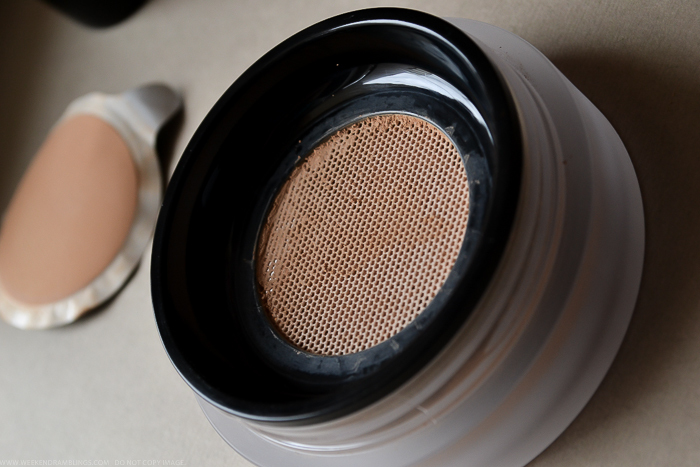 The top of the powder case is covered with a mesh/sifter through which the powder is dispensed. This mesh moves when you press down on it with a brush - like how cloth would move. I like the mesh for how conveniently it dispenses the powder - just pressing down on it gets some powder out on to the brush. The packaging is a nightmare to travel with, though. Even tapping ever so lightly on the tub/jar brings out a lot of powder. It doesn't fly out of the packaging, but once you open the lid, there will be quite a lot of powder over the mesh, and you cannot tap or push it back in through the sifter. How to Use the Chanel Vitalumiere Loose Powder Foundation: Chanel suggests turning the powder case once (with the cap on, of course) and tapping once to dispense the powder. 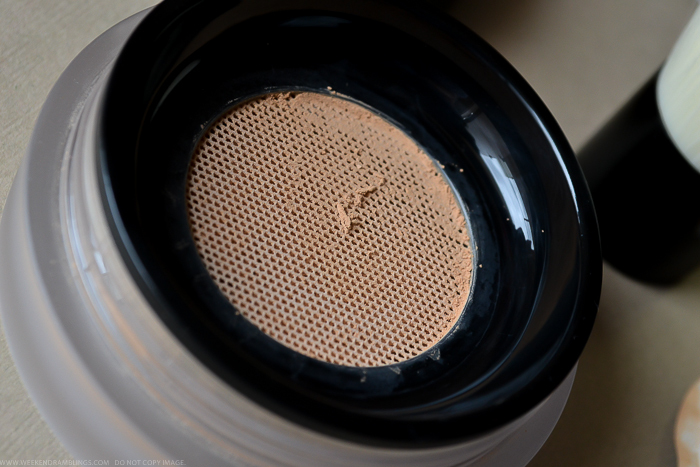 Swirl the brush over the sifter to pick up the powder and buff it into the skin in small circles. I find it much easier to just press on to the mesh/sifter (without any flippping or tapping) with a brush to pick up a light dusting of the powder. 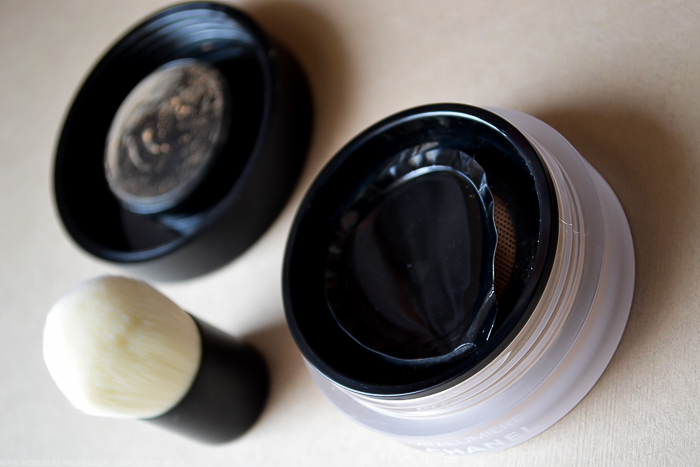 Using the kabuki brush to buff in the powder gives a heavier application. 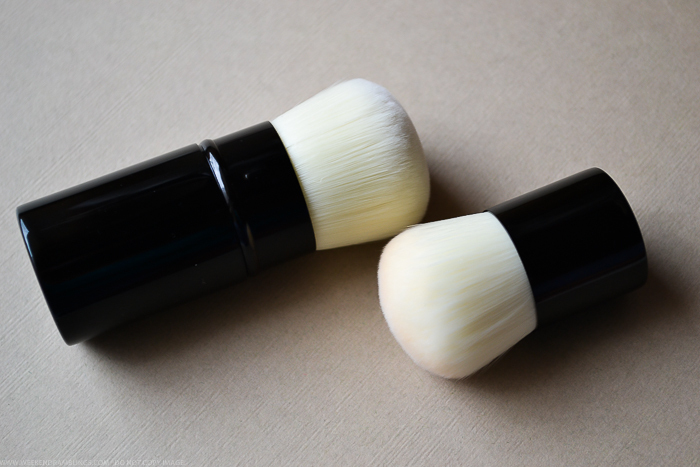 I use the Suqqu Face brush for a sheer application over my regular foundation - more like a setting/finishing powder. Chanel mini kabuki included with this foundation -it's supersoft and does a great job of blending the powder foundation into the skin. Pressing the kabuki (or any other brush) on to the mesh picks up just enough powder to blend into my skin without overloading it. As I mentioned earlier, this powder foundation is available in 5 shades, and I picked the shade Beige 50. This is the darkest shade, and it's just about right for my skin tone. I could have gone a teeny bit darker, but there was no darker shade for me to try on and the lighter Beige 40 was definitely a bit ashy. This is a neutral shade with no shimmer in it. The powder is fragranced, much like a lot of Chanel products are. While this is a powder foundation, I didn't really buy this to use as a foundation on it's own. 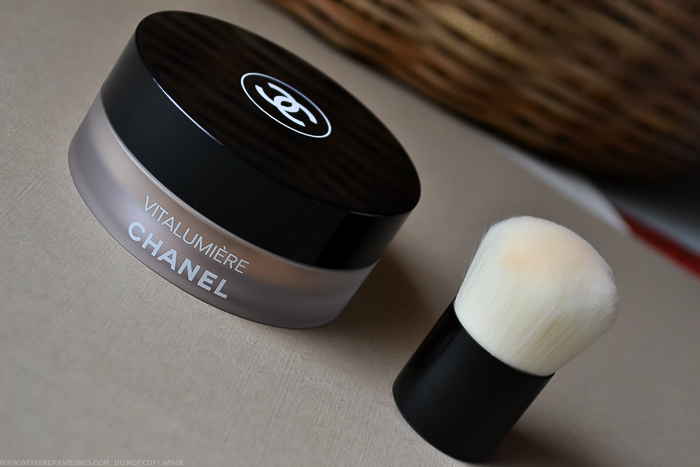 I have been on the lookout for a good powder to use over my current foundation (Chanel Perfection Lumiere), and that's how I have been using it. For the photos below, though, I have used it on it's own (concealer for my undereye area) to give an idea of the coverage this provides - light/sheer coverage that blurs and softens blemishes and definitely tones down the shiny spots, thus making pores a little less obvious. Without foundation - I have used a bit of NARS Radiant Creamy Concealer in Caramel under my eyes. Eyes/brows: Browns from the Avon True Chocolate Quad and UD Perversion eyeliner applied lightly. With Chanel Vitalumiere Loose Powder Foundation, applied using a kabuki brush. I haven't changed anything else with the rest of the makeup, though the outside light did change a bit by the time I took this photo. The powder foundation on it's own just blurs and softens the blemishes, but when it comes to more heavy duty, raised acne marks, I would definitely need a concealer if I was looking for any degree of coverage. I bought the Chanel Vitalumiere Loose Powder Foundation to use in an addition to my current foundation-concealer routine. I was not looking for any sort of coverage, and I definitely was not planning on using this on it's own. I use a soft, fluffy brush to apply a very light veil of this powder, and it helps brighten my skin and keeps my makeup looking fresh through the day. The powder feels quite smooth, and the finish is almost matte while giving a lovely, lit from within sort of glow - without any shimmer. I have oily-combination skin, and it's perfect for my skin type. 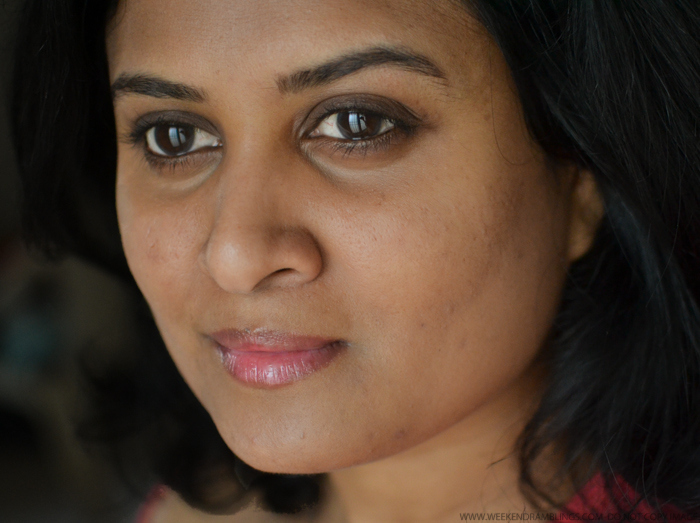 It doesn't make my skin overly shiny or exaggerate any dry patches and has definitely not caused any breakout so far. The SPF 15 doesn't hurt either. Overall, a definite must-have..for me. 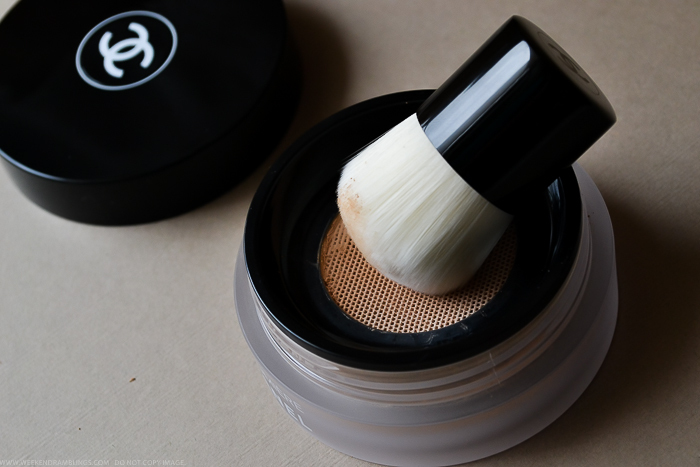 Chanel Vitalumiere Loose Powder Foundation is definitely the most expensive in the Chanel foundation lineup, and part of that cost, I guess, is because of the kabuki that comes with the foundation. Chanel Kabuki brushes - Mini kabuki that comes with the Chanel Vitalumiere Loose Powder foundation and the Chanel Retractable kabuki brush. The mini kabuki is almost the same size (just a little smaller) as the retractable kabuki (cost about $70). Is just as dense and feels just as soft. 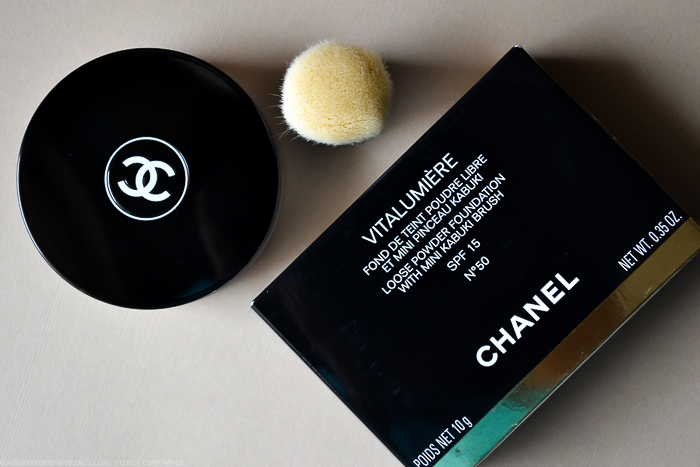 As much as I love the Chanel Vitalumiere Loose Powder foundation, I think it can be a bit disappointing depending on how you plan to use it. This does a great job of brightening skin and giving it a luminous, radiant appearance, but I don't find it all that useful in terms of coverage when used on it's own. It's labelled "foundation," but the coverage it provides is quite sheer, almost like using a powder. Of course, it lasts longer than a powder would. 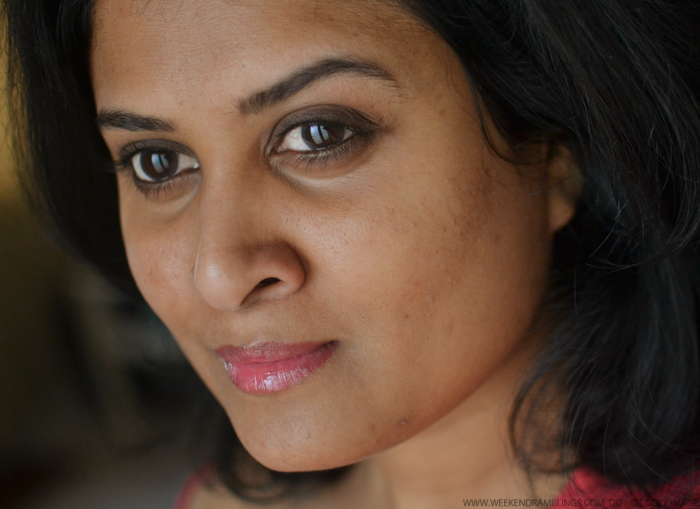 A heavier application just looks cakey without doing anything useful for the blemishes. This powder foundation seems best suited for someone with problem-free skin who doesn't need any coverage and/or if you want to use this as a powder over another foundation with more coverage (which is what I do). Hello, thanks for your review! I was checking this powder foundation. Somehow I feel, most powders and foundations are best suited for perfect skin :) Nevertheless, I like powder foundations more than liquid ones now. I use concealer for blemishes and discolorations, and go over with powder, enough coverage for me, but everyone likes different effects and coverage.